SecurePay is an online payments expert and a business of Australia Post that provides e-commerce payment solutions for businesses and organizations of all sizes. It offers a wide range of online payment solutions, including SecurePay Online Payments, a complete online payments solution that can typically get businesses selling online in five business days. 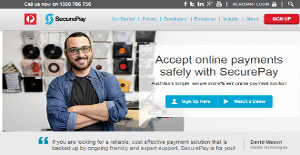 Touted as a leader in the online payments industry in the Australian market, SecurePay has an extensive experience working with Australian businesses. For more than 15 years, it has helped more than 40,000 businesses get on track with their e-commerce needs, especially the small and medium businesses. SecurePay Online Payments gives the business’ customers more payment choices such as Visa, MasterCard, American Express, Diners Club International, and PayPal. It allows them to make an online purchase straight away, which can help businesses convert more sales. It offers a simple online application process with no visits to banks required. SecurePay offers as well an easy integration process as it can integrate with many major online shopping carts. Users are also provided access to major Australian banks for easy management of payments. It guarantees secure online payments that ensure to protect every transaction and customer data from fraud or other incidences of unauthorized access. SecurePay accounts can be managed very easily; users can easily see the information related to the account that they need at any time. There is also detailed reporting for better transaction management and to formulate effective marketing strategies. Payment Gateway vs Processor: What is the Difference? If you are interested in SecurePay it may also be a good idea to investigate other subcategories of Best Payment Gateway listed in our database of B2B software reviews. Every organization has different requirements and requires a software that can be customized for their size, kind of staff members and customers, and the specific industry they are in. For these reasons, no system can offer perfect tools off-the-shelf. When you try to find a software system, first be sure what you want it for. Read some SecurePay reviews and ask yourself do you want basic tools or do you need complex functionality? Are there any industry-specific functionalities that you are looking for? Obtain the answers to these queries to aid your search. There are multiple elements that you need to consider and these include your finances, specific business wants, your organization size, integration requirements etc. Take your time, try out a few free trials, and finally choose the system that provides all that you require to improve your firm efficiency and productivity. How Much Does SecurePay Cost? SecurePay offers a range of different payment gateway and billing options. These are priced according to how many transactions you process per month. Contact the vendor on 1300 786 756 and their payment specialists will provide you a customized quote for your transaction volumes. We realize that when you make a decision to buy Payment Gateway it’s important not only to see how experts evaluate it in their reviews, but also to find out if the real people and companies that buy it are actually satisfied with the product. That’s why we’ve created our behavior-based Customer Satisfaction Algorithm™ that gathers customer reviews, comments and SecurePay reviews across a wide range of social media sites. The data is then presented in an easy to digest form showing how many people had positive and negative experience with SecurePay. With that information at hand you should be equipped to make an informed buying decision that you won’t regret. What are SecurePay pricing details? What integrations are available for SecurePay? If you need more information about SecurePay or you simply have a question let us know what you need and we’ll forward your request directly to the vendor.